To celebrate the hit film NEED FOR SPEED releasing on Blu-ray and DVD (21st July), six supercars will spend two days convoying across the country – to partake in the ultimate supercar showdown! Starting off at Liverpool’s Albert Docks on Wednesday 16th July and passing through key cities including Manchester (MediaCity), Birmingham (M6 Toll) and Warwickshire (PRODRIVE racetrack), local residents and car fans will be encouraged to interact and follow the tour, until it ends in a secret London location on Thursday 17th July. The whereabouts of the supercars will be documented on the @NeedForSpeed_UK Twitter, where fans have the opportunity to vote for the car that they want to be crowned as the winner of the ‘Need for Speed Convoy’. By voting, fans will be selected at random to win DVD or Blu-ray copies of the film, including a limited edition steelbook, and merchandise. When the six supercars enter the final leg of the tour – a secret location in London – the champion of the convoy will be revealed in front of TWENTY – THIRTY SUPERCARS that have met for the biggest supercar showdown that this London hotspot has ever seen! The convoy is representative of the journey Tobey Marshall (played by Aaron Paul) embarked on in NEED FOR SPEED, where he too spent two days traveling across country to take part in the De Leon – a winner-take-all race (held in a secret location) where six supercars go head-to-head. The cars involved in the De Leon race include a GTA Spano, a Buggatti Veyron, a McLaren P1, a Saleen S7, a Koenigsegg Agera R and a Lamborghini Sesto Elemento. This is one of the first UK customer cars and one of only 375 units worldwide; this is also the latest hybrid hypercars. The car value is approximately £1m. This has a 700 bhp and can go from 0-60mph in under three seconds! Its top speed is 200mph + and its value is estimated at £300k. This is the only F40 factory yellow model that exists and was originally owned by Rod Stewart. Its value is estimated at over £750k. There are only three examples in the world and this one has a 745 bhp! The car value is £300k +. Chassis number 004, this is one of the original development cars. After this, it was transformed in to a racer and campaigned in the British GT championship before being returned to road-car spec. The car value is in excess of £500k. The BAC Mono is a new breed of single seater road/track cars. Built in Liverpool, its value is approximately £120k and will be driven by Test Driver Oliver Webb, who has just achieved a podium finish, racing at Le Mans. Fans can vote for their favourite to be crowned as the ‘convoy winner’ by re-tweeting images of their chosen supercar from the @NeedForSpeed_UK Twitter account, or by including the hashtag #NeedForSpeedConvoy when they mention the car in their tweets. All of the above drivers/owners are part of Supercar Driver – the ultimate club to be part of if you own a supercar in the UK. 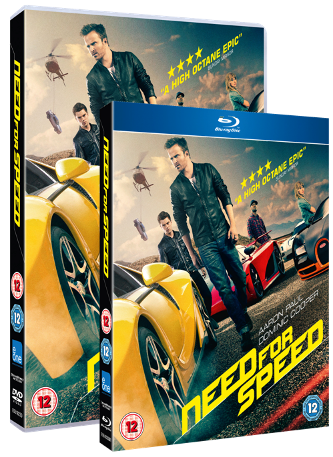 Packed with special features, NEED FOR SPEED is available from 21 JULY on 3D Blu-ray, Blu-ray and DVD, and available to pre-order now on AMAZON. Exclusive Limited Edition Steelbook available from Entertainment Store.